How often do you hear a story on the radio or television of yet another Super Star Athlete throwing their career down the drain by using illegal substances to enhance their athletic abilities? Why are these athletes willing to risk their careers, their health, their families and more just to be stronger? Let's face it, everyone wants to be stronger, especially athletes. We've all heard the term 'Juicing' which is used to describe the act of using anabolic steroids to 'inflate' your muscles. The problem with juicing is that the results are temporary and there are a myriad of harmful side effects. Anabolic Steroids can cause elevated blood pressure, high cholesterol, heart disease, acne, pre-mature baldness, aggressive or enraged behavior, severe mood swings and other undesirable gender specific side effects such as unwanted facial / body hair. A natural and effective supplement called "Endothil CR" became available several years ago and is still in use today. The creator of stimulite , Dr. Robert Shore says that his Stemulite Fitness Formula supplement can be used by athletes and bodybuilders to develop muscle mass and sustainable strength in place of Anabolic Steroids and the temporary results they produce. 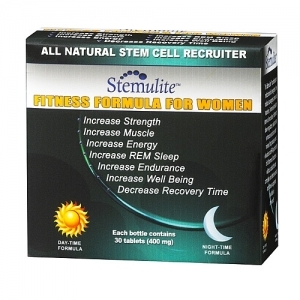 The core ingredient of this Stemulite Fitness Formula supplement is a natural dietary adult stem cell agonist. The key to building muscle mass is to tear down the muscle by working the muscle and creating micro-tears in the muscles and ligaments. These tears are what cause the soreness you feel after a rigorous workout. Stemulite works quickly to activate dormant adult stem cells in our bodies and begin the process of repairing the muscle and building new muscle. This new muscle is sustainable muscle, not a temporary inflation typical of muscle enhanced by anabolic steroids. Corey Simpson, a Fitness Professional and former Mr. Florida said "Stemulite is the most powerful supplement I have ever put into my body, period. In the first couple of weeks of using Stimulite, I increased the weight I was lifting by 30 percent and I doubled the amount of repetitions in my workout. It was a little hard to believe. In weeks, my muscle definition changed and I dropped excess water weight. In addition, Stemulite has also given me a great and deeper sleep, which is so important for recuperation. I just feel better than ever and have so much more endurance and energy. 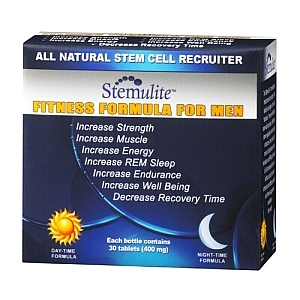 We receive very few reports of side effects using Stemulite Fitness Formula. We offer a money back guarantee to anyone who is dissatisfied with the product or who experiences unwanted side effects. To learn more about Stemulite and how it can work for you, log on to stemulitefitnessformula.com and watch the information packed video. More questions? Call 541-997-6100 anytime from any time zone.